Installing photovoltaic solar panels on your residential or commercial building is a great way to reduce your energy costs, lock in your electrical rates and qualify for generous incentives from the federal and Massachusetts state government. Whether you want to save money on your home electrical expenses or operate your commercial space at maximum efficiency, solar panels are an easy and environmentally friendly solution. Fully qualified as photovoltaic (PV) installers, One Way will educate you about your solar panel choices, evaluate your roof and building structure, and handle every phase of the installation. While solar panel systems are typically mounted directly on the roof, we’ll assess your roof space and recommend alternate installation areas if they’re more appropriate. Our highly qualified licensed electrician will appraise your electrical system and recommend any necessary repairs or upgrades to accommodate the PV installation. 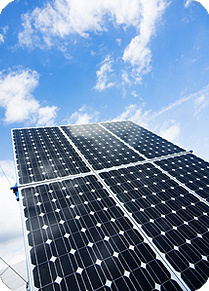 Solar panels offer free energy from the sun, using crystalline PV cells that convert sunlight into power. Once the solar energy is converted into power for your home or commercial building, unused power flows back to the local utility grid. This means you can sell your excess energy back to the utility company. Massachusetts is one of several dozen states that has a "net metering" law that states the utilities *must* buy your excess electricity from you at full market prices. In addition to this money-making opportunity, One Way can help you source new government financial incentives for installing energy-saving solar panels. Solar panels are an exciting option for meeting your electrical needs and saving money, so call us to find out how you can take advantage of this win-win opportunity.